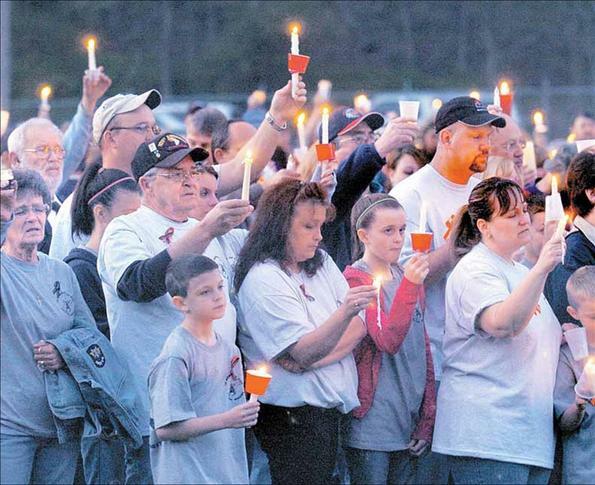 April 18, 2010 by Ken Ward Jr.
Community members hold candles at a vigil for the 29 miners who died in the explosion at Massey Energy Co.’s Upper Big Branch mine in Montcoal. About 250 people attended the April 10 vigil at March Fork Elementary. Gazette photo by Kenny Kemp. The Gazette has several tributes to the Upper Big Branch miners online and in print. Here’s a link, and here’s the text from one tribute that appeared in our print edition today. Earlier this month, Carl Acord shared a big Easter dinner with family and doted on his infant grandsons, 9-month-old Chase and 3-month-old Cameron, said his sister, Sherry Cline. Acord also enjoyed fishing with his two sons, 24-year-old Cody and 19-year-old Casey. Even though he was about 6 feet tall, everyone called Acord “Pee Wee” – which he hated. “That was his nickname since he was a little tyke. It just stuck,” Cline said. Acord, 52, had worked in mines for 34 years and liked the work, Cline said. But he told his family the day before the explosion that he was concerned about the mine’s roof and worried about going to work. Jason Atkins was born and raised in Boone County, near the coal mine where he lost his life, said his father-in-law, Rick Withers. The 25-year-old miner and his wife, Amanda, 28, met when they were students at West Virginia Tech and got married in 2008, Withers said. Withers said he was not sure when Atkins began working at the mine. “He was an hourly guy,” Withers said. Atkins played second base on his high school and college baseball teams, but left Tech without graduating, Withers said. He enjoyed golfing. Christopher Bell loved to draw and detail cars. The 33-year-old also loved spending time with his wife, Angela. He loved playing with his four kids, Alexis, Meadow, Christopher and Skylar. He was born in Dayton, Ohio, the son of Christopher L. Bell and Kathy Darlene Acord Bell. Greg Brock loved spending time on his farm. The 47-year-old left behind his fiancée, Patti Stover, and son, Greg Kyle Brock. He and his son loved spending time with Patti and her daughters, Shayla and Brooke Stover. Brock was a NASCAR fan and loved to hunt and fish. He always had a vegetable and flower garden. Brock, of Clear Creek, juggled life in the mines with being involved in his children’s activities. He often picked up his 12-year-old son for baseball and basketball games and brought him to a nearby store for soda and pizza, said store operator Glen Duncan. Brock also has a daughter, two grandchildren, two sisters and two brothers. “He’s just a good, hard-working man and a good daddy,” Duncan said. Kenny Chapman was a roof bolter in the mines. His second job, it seemed, was making others laugh. He’d have stories to tell about his hunting and four-wheeling excursions or his fishing trips to Indian Mills, Plum Orchard Lake or Burnsville Lake. The 53-year-old Fairdale resident’s specialty was practical jokes. “He was somebody that always had a good time,” said a nephew. Chapman and his wife have a 13-year-old son, Mikey, and Chapman had three children from a previous marriage. “He was really close with his family and his brothers,” said nephew Mike Chapman. Just a few months ago, Robert E. Clark, 41, came forward and committed himself as a born-again Christian at the Beckley Church of God, his pastor said. The decision in January offered a degree of solace to Clark’s churchgoing friends. He leaves behind his wife, Melissa, and a young son. “It really is a big relief to know that all is well with his soul, that he can go to heaven,” said the Rev. F.D. Sexton, who has spoken with Clark’s family since the explosion at the mine. Sexton said he remembered Clark’s big smile as the miner left an Easter service at the church. “Everything was still good with him as far as his soul was concerned,” Sexton said. Cory Davis played baseball in high school and followed his family into the mines. The 20-year-old from Dawes worked with his father, Tommy Davis, and cousin, Timmy Davis Jr., at a surface mine, but all three were laid off in the past two years. All three ended up at Massey Energy. Cory Davis loved the outdoors and would often spend his weekends at a family camp on a mountaintop. Timmy Davis Sr. loved coal mining – and when he wasn’t doing that, he was out hunting and fishing. Davis Jr. said his uncle, Tommy Davis, and brother, Cody Davis, also were at the mine at the time and survived the blast. Cody Davis and his 51-year-old father were best friends, Davis Jr. said. Cody Davis was on his way in at the time of the blast, said Davis Jr., who works as a coal truck driver. Michael Lee Elswick had an affectionate moniker for practically everyone in his family. The 56-year-old Elswick and his wife, Bobbie, were married 36 years – the same number of years he had been working in the coal mines. Elswick was laid off earlier this year at Patriot Coal and his daughter said he had been at Massey Energy’s Upper Big Branch mine for only four days when the April 5 explosion killed 29 miners in Montcoal. Jami Cash nearly died from Crohn’s disease in 2002. Her father sat with her and held her throughout her ordeal. Bobbie Elswick has had a stroke and heart trouble and has a pacemaker. “His biggest fear in his world was losing one of us before him,” Cash said. William “Bob” Griffith came from a family of miners, went into the mines as a young man with his father and worked there like his brothers. “He learned from the best,” said Griffith’s brother, Mike, who explained how the trade was a family tradition. Griffith, 54, lived in Glen Rogers with his wife, Marlene, and raised a son and daughter, said James Griffith, another of the late miner’s brothers. When he wasn’t working, Griffith and his wife were fixing up their 1967 Camaro. His nephew, Jason Griffith, remembered his uncle’s smile. He was “always laughing, carrying on, joking,” Jason said. Steve Harrah – known to his co-workers as “Smiley” – was “always thoughtful and would give you a hand,” his father-in-law said. The 40-year-old enjoyed hunting deer in Pocahontas County, said father-in-law Jack Bowden Jr., who also is director of the Raleigh County Emergency Operations Center. Harrah lived in Cool Ridge with his kindergarten-age son, Zach, and wife of 10 years, Tammy. Harrah’s sister Betty said other workers thought of her brother as a good boss. “He wouldn’t ask them to do anything he wouldn’t get down in there and do,” she said. Harrah was leaving the mine when the explosion happened. The mining company told the family that Harrah was killed instantly, Bowden said. For Dean Jones, Easter Sunday dinner wasn’t his last taste of his mother-in-law’s cooking. Alice Peters said Jones loved deviled eggs in particular, and she fixed a tray of them on April 4. But she forgot to put the eggs on the dinner table. So after dinner she summoned Jones’ 13-year-old son Kyle to go to the front porch to let his dad know that the eggs were available. “He said he would take them home with him,” Peters said. The next day, Jones was among the 29 workers killed in a midafternoon explosion at the Massey Energy’s Upper Big Branch Mine. Peters would spend the next several days watching her grandson at Jones’ home in Beckley while her daughter, Gina, awaited word on her 50-year-old husband with other grief-stricken families at the mine site. While at the house, Peters remembered to check Jones’ refrigerator to see if her son-in-law had enjoyed the eggs before going to work the next day. An avid outdoorsman, Rick Lane was content tending to his horses and cattle on a 25-acre farm in Cool Ridge. Missy Schoolcraft, Lane’s cousin, said Lane always fed everyone else’s horses in the winter. And when she had a horse that was lame, Lane would take care of it on his farm. The 45-year-old Lane, a longwall production foreman, had been with parent company Massey for about four years and worked at the Upper Big Branch mine for about a year. He and his wife, Kim, have a 23-year-old son and a 9-month-old grandson. William Roosevelt Lynch wore many hats, including that of a coal miner. Over his career, the 59-year-old, who went by Roosevelt, was a teacher, coached three sports and was about to welcome his fourth grandchild into the world. He also worked in the mines for more than 30 years. Lynch was among the dead, said his brother, Melvin Lynch of Mount Hope, who also was in the mine at the time. Roosevelt Lynch was a longtime Oak Hill resident who coached basketball, football and track and taught on the high school and middle school levels. Oak Hill High basketball coach Fred Ferri said Roosevelt Lynch also competed in a summer basketball league in Beckley. Joe Marcum was married to Kathy Maynard Marcum for 39 years. For 35 of those years, he was a coal miner. The 57-year-old was a member of the Church of the Living God and a charter member of the Lenore Volunteer Fire Department since 1982. He leaves behind two daughters, Kathy Jo Marcum and Garnet Marcum Murphy, many nieces and nephews and an extended family. The Democrat known as “Joe Bug” also was a mainstay in Mingo County politics. Halcy Hatfield of Elk Creek, a longtime friend and former member of the Mingo County Commission, said the 57-year-old Marcum owned a trailer near the mine site and sometimes stayed there instead of making the hour-plus drive home. Ronald Lee Maynor of Clear Creek enjoyed hunting year-round. A photo of him hangs above an ice cream freezer at a local convenience store that doubles as a game-checking station. The photo shows him wearing camouflage and holding the head of a freshly shot deer. According to his obituary, the 31-year-old Maynor helped his daughter Kaitlyn kill her first squirrel last year and took her fishing. He also enjoyed tossing a football and wrestling with his son Hunter and took him for rides on his all-terrain vehicle. Maynor and his wife, Helen, were married 11 years. Nick McCroskey, 26, was a bundle of energy and a devoted sports fan, said longtime friend Shanda Staton. McCroskey graduated from Bluefield State College in 2006 with an engineering degree and loved a variety of sports. He regularly attended NASCAR events at Bristol Motor Speedway in Virginia, and also loved to go four-wheeling and dirt bike riding. He was a fan of baseball, water skiing, hunting and fishing and owned a motorcycle, said Staton, who attended college with McCroskey. James “Eddie” Mooney loved life and loved to make people laugh. He was a hard worker and always put his family first. The 51-year-old was married to Sheila Mooney for 33 years and left behind his daughter Misty and her husband Eric Case, his 14-year-old son Austin and a big extended family. He was a member of the Rumble Community Baptist Church. Mooney, a miner for more than 20 years, was a hard worker and enjoyed taking his son hunting and fishing. He liked spending time in the woods, camping and four-wheeling. He also loved to take his 1978 Corvette out for a cruise on the weekends. Adam Morgan wore No. 24 on Wyoming East High School’s football team in his senior year in 2006 when the Warriors made the state Class AA playoffs. More than his athletic abilities, Principal Barry Smith recalled Morgan for his manners. Wyoming East held a moment of silence Monday for Morgan, 21, of Pineville, and three other victims of the disaster – 2001 graduate Nick McCroskey and two miners whose relatives worked at the school. Go to Rex Mullins’ home in Lively, and it becomes obvious what college team he rooted for – the West Virginia Mountaineers. Mullins’ den is decorated in the gold and blue school colors, including two WVU recliners. Mullins said his 50-year-old brother regularly attended Mountaineer football games in Morgantown and basketball games during annual trips to Charleston. Rex Mullins would go on and on about former football coach Rich Rodriguez, who left in a firestorm for Michigan after the 2007 season. And he was especially happy with the basketball team’s season that culminated in a Final Four appearance in Indianapolis. That came two days before the explosion that killed 29 miners at the Upper Big Branch Mine. “He was waiting for them to win a national championship,” Clay Mullins said. When 25-year-old Josh Napper started his job in the mines a few months back, he showed his fiancée, Jennifer Ziegler, an envelope with a handwritten note inside. “‘You keep it sealed until something happens to me,'” his mother, Pam Napper, recalled him saying. Ziegler opened the envelope after last Monday’s explosion and rushed to show it to Pam Napper, who was gathered with other families awaiting word on the miners’ fate. “I want you to read something,” Pam Napper recalled Ziegler saying. The letter was written to the couple’s 19-month-old daughter and the two women. “If anything happens to me, I will be looking down from heaven,” his note read. Howard “Boone” Payne was a “gentle giant” in his early 50s with flaming red hair and broad shoulders. Payne began working as a coal miner shortly after graduating high school in 1977. He had worked for Massey Energy for eight to 10 years. Wright said Payne, 53, never expressed any fears about his profession. As a former coal miner, himself, Wright understands why. Dillard Earl “Dewey” Persinger was proud to be a coal miner. He’d worked for Massey Energy for two years when the disaster happened. The 32-year-old will always be remembered as someone dedicated to his friends and family. He loved spending time with his wife, Heidi, and two sons, James and Devin. In his book, family was the most important thing in the world. Persinger loved country music and often listened to it in his spare time. He was a lifelong resident of Crab Orchard. Joel R. “Jody” Price, 55, spent four years in the Navy. A member of St. John United Holiness Church, he is survived by his wife, Dorean D. Price, stepsons John Jones and Alan Johnson, grandchildren Peyton Jones, Myron Johnson, Jasmine Johnson, Caleb Johnson, Malcolm Johnson, Amiya Johnson and Trenton Jones and his extended family. Bishop Fred Simms of Heart of God Ministries officiated at Price’s funeral and said Price was known for his frequent family barbecues. Gary Quarles’ life was his wife and two children. The 33-year-old from Naoma took trips every summer to Myrtle Beach, S.C., with the kids, ages 9 and 11, and his wife. He liked to hunt everything from raccoons and deer to wild boar, and he had wanted to stay home from work Monday, the day of the explosion, because his children were still on Easter break, she said. He started coal mining when he was 18. He was among those finishing a 10.5-hour shift when the explosion happened, his wife said. Deward Scott met his wife, Crissie, when she was his karate student. The pair loved to go hunting together – Deward taught her to bow hunt when they first met nearly 20 years ago, she said. They had been together ever since – usually enjoying the outdoors hiking, hunting, fishing or gardening. The 58-year-old Montcoal resident had been a miner for 21 years and loved his job. He was kind and outgoing, Crissie Scott said. Grover Skeens found religion later in life and was involved in that extensively, said his brother, Gary Skeens of Dunbar. Grover Skeens, 57, of Montcoal, was one of five siblings who grew up in Twilight, Boone County. Skeens joined the Marines after the Vietnam War before becoming a coal miner like his brother Gary. About 15 years ago, Skeens was baptized and had a strong church involvement ever since. For Benny Willingham, retirement was just five weeks away. The 61-year-old from Corinne had been a coal miner for 30 years and spent the last 17 working for Massey, said his sister-in-law, Sheila Prillaman. Willingham and his wife were supposed to go on a cruise next month to the Virgin Islands. Willingham was remembered at his funeral as a generous and religious man who had recently given a stranger his used car. He was known for other random acts of kindness, like filling up a gas tank or giving away $10. Ricky Workman had an affection for wheels. One of the first images on his MySpace page is a motorcycle. The 50-year-old Colcord resident loved his Harley-Davidson, and in the summer drove miniature race cars, said his niece, Tammy Cruz of Cleveland. Workman’s MySpace page also listed watching dirt track races, fishing, hunting and spending time with family as his favorite activities. He and his wife, Annette, have three daughters and seven grandchildren. Thank you for your writings about the miners that lost their lives and their families and friends who have suffered. May the souls of the departed miners be at peace. May God give comfort and strength to their families and friends. May their memories be eternal.